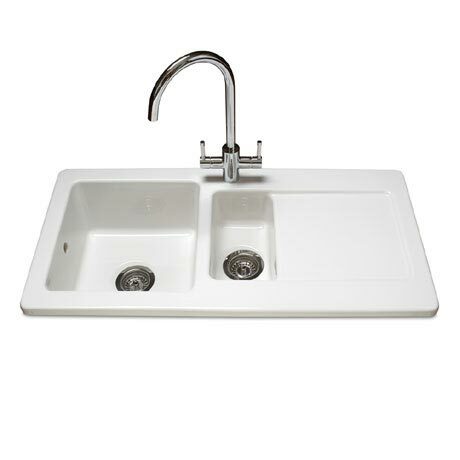 This Reginox Contemporary White Ceramic 1.5 Bowl Kitchen Sink is from the Regi-Ceramic range, made from the highest grade fine fireclay it is able to withstand the daily uses of the kitchen. This inset sink requires a minimum cabinet size of 600mm and has a fully reversible drainer. A polished chrome basket strainer waste is also included. Reginox ceramics offer a stylish contemporary or traditional alternative to other materials. With many different styles available to choose from Reginox ceramics offer something to suit all kitchens. This great looking sink comes with a 10 year manufacturers guarantee. Hi, when installed this Reginox Kitchen Basin sits 25mm height from the worktop. Thanks! Q. what size do you need to make the cut out in the work top? Hi, there are dimension drawings on our website under 'product dimensions'. This Kitchen Sink comes with a template. I hope this helps, pelase let me know if you require any further info!